Becoming popular in Christian devotion around the ninth century, the image of the crucified Christ was commonly depicted during the next four centuries as alive and often crowned, thus evoking both his human suffering and the eternal triumph of his conquest of death. In the thirteenth century, however, Christ's agony and the sufferings of those who witnessed his death began to be emphasized. This group is remarkable because of its impressive size and its survival as an ensemble, including two witnesses, the disciple John and the Virgin Mary. The deity once wore a royal crown (an attribute still retained by Mary), in accordance with traditional depictions of Christ's divinity and rulership. 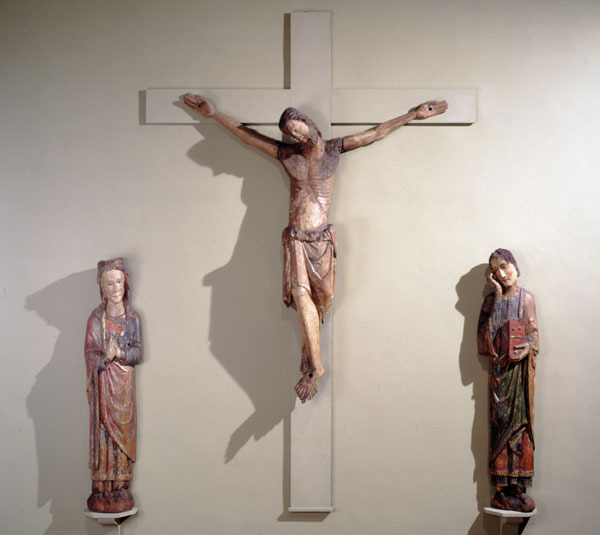 Once brightly colored with paint, this wood sculpture reflects a transition in style from the thirteenth to the fourteenth century; the rhythmic curves of the exposed ribs, the terraced drapery, and the stiffness of John and Mary continue the more abstract rendering of earlier medieval art, while the soft, oval faces of all three figures and Christ's sagging body and downcast head convey the emotional appeal of an emerging style.